"SPUDNUT DONUTS ARE THE BEST. I OWN A SPUDNUT SHOP IN BEREA, OHIO AND WE STILL MAKE THEM THE ORIGINAL WAY. I HAVE INFO ON THE SPUDNUT MUSEUM. IT IS IN LAFFEYTE,IND. IF YOU WANT EMAIL ME AND I CAN GIVE YOU MORE INFO. WE SUPPLIED 10 DOZEN OF OUR SPUDNUT DONUTS FOR THE MUSEUM GRAND OPENING 2 YEARS AGO,EVERYBODY REALLY LOVED THEM. WELL GOT TO GO MAKE THE DOUGHNUTS." "This message is coming to you from the Spudnuts Museum - America's Finest Food Confection Collection! Part of the mission of the Museum is to provide educational programs regarding this historically significant and delectable confection - an American original, loved by many but understood by few! 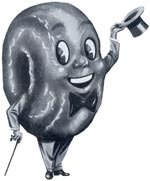 In that regard, the Spudnuts chain was started by Al and Bob Pelton of Salt Lake City, Utah. In 1940, they began experimenting to find a recipe for a doughnut that was not heavy or greasy and was easy to digest. After throwing away many batches of less-than-thrilling products, they struck on winning formula that used mashed potatoes. When they later invented a dry Spudnut mix, the sky was the limit! By mid-1948, there were more than 200 stores in more than 30 states. A franchise, which included equipment and floor plans, cost $1,750 (in cities with a population under 10,000, a bit more for those in larger cities). While (to the best of our knowledge) the Pelton Spudnut Corporation no longer exists, 37 Spudnut stores continue to operate across the U.S. These operations have had to tweak the original recipe a bit because the Pelton's dry Spudnut mix is no longer available. And, many of the remaining, dedicated Spudnut gastronomes have done a fine job! So, include a Spudnut shop stop in your vacation travel plans." "Recently, someone wrote to ask whether writer and chemist Edward Elmer Smith (1890-1965), aka Doc Smith, had developed the potato-based recipe used in making Spudnuts. No way! That history-altering invention was the brainchild of the Pelton brothers, founders of the Spudnuts chain. The Pelton boys were working in San Francisco; Bob for a drugstore, Al selling electrical appliances. They wanted to open their own business and thought there was a market opportunity in doughnut making, if they could come up with a good recipe. 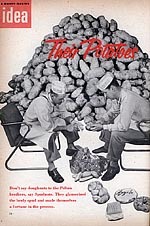 Potato flour was newly invented and it became the centerpiece of the Peltons' quest to develop the perfect doughnut. The brothers moved to Salt Lake City, opened a little shop and struck out repeatedly with potato flour based doughnut recipes. Then, Al came up with the crazy, (but clearly inspired), notion to use a mashed potato mix and...waalah!....the result: a large, fluffy, tasty, golden brown delicacy. As was true of Doc Smith, Bob went into the Navy to assist in the war effort. Al kept the Spudnut flame alive. And, when Bob returned from the war, the brothers developed a dry Spudnut mix that allowed them to ship the product without spoilage and the franchise was born. So, while Doc Smith may have developed a potato-based doughnut batter, it was not the one that propelled the Pelton brothers into Spudnuts fame!" The prorietor of the Spudnuts Museum, Dr. Kate Sherony, died Thursday, August 29, 2013. Presumably, that is the end of the Spudnuts Museum. A very good article about the rise and fall of the Spudnuts chain. Another good article about the history of the Spudnuts franchise. "Except for physical appearance, Spudnuts have no relation whatever to other similar shaped products. Spudnuts are large, fluffy, and airy, and are never soggy or greasy. They are made of a special blend of finest wheat flour, dehydrated potatoes ... milk solids, powdered whole eggs, and other vital ingredients -- all mixed and blended perfectly to the secret Pelton formula." Click here to read the rest of this very good article from the Bastrop Daily Enterprise in Bastop, La. Blog article with photos, about a Spudnut shop in Ft. Collins, Colorado, from the early 1950's to the 1970's. A long forum thread about Spudnuts on RoadFood.com. Who owns the right to the name "Spudnuts"? Douglas Bagley (see paragraph above) says he does. Someone else, MP-OTHA Corporation, operating Spudo's Donuts and More in Galesburg, Illinois, (see listing below) says it does. On March 3, 2011, MP-OTHA sued Douglas Bagley in the United States District Court in Utah for trademark infringement and other associated items. It will be up to the court to decide the ownership of the name unless the parties to the lawsuit settle it themselves. If you'd care to read the complaint filed by MP-OTHA, here it is. Be aware that a complaint is only one side of a dispute. On November 22, 2011, the court denied a preliminary injunction by MP-OTHA against Douglas Bagley which would have prevented his use of the name SPUDNUTS and similar names. The court said that the facts in the case "at this stage of the litigation, do not clearly favor one side or the other". Is there more to come?. At least for now, both parties have the right to use the Spudnuts name. If you want to read the one-page court decision, here it is. See the next paragraph. August 16, 2012 - Received a notice from Douglas Bagley saying: "As of Aug. 15, 2012, both parties in litigation struck an accord to drop all lawsuits. Mike Patton and Douglas Bagley are both focused on promoting the name, the characters, and the mixes. Trademarks have been obtained worldwide, and we are both focusing our energies into bringing back the Spudnut® name into it's former prominence." Comment: That lawsuit (with the settlement) was between the two parties named above. It has no necessary effect on other people or organizations that might claim rights to the name "Spudnuts". Please send updates about current Spudnut shops. Please read the Notes at the bottom of this page. Brookshire Food Stores says they have Spudnuts in all their stores (in states AR, LA, MS, TX) in dozen-count boxes from "one of their suppliers". Please try them and report back here. 6/28/2011 report: "They may be made out of potato flour but they're not Spud Nuts. They were as heavy as hockey pucks and just as tasty." Very good article with photos about Spudnuts history and the above two places. 8/18/2009 report: Excellent Spudnuts, reminding me of the original ones. 12/9/2012 report: Wonderful Spudnuts, definitely worthy of the name. Sure seemed like the long-ago original. Nature's Pantry, 1572 State Route 23 North, Streator, IL 61364 815-331-9118 (map) NOTE: Said to make Spudnuts only on special order. Another list of Spudnut shops. It also has a link to photos of a Spudnut shop in Golden, Colorado, in 1953. 1. The quality of Spudnuts in current shops is reported to vary a lot. The original franchise ended a long time ago. How close the "mix", or recipe, and process of a particular current Spudnut shop is to the original is pretty much an unknown. 2. Ask the person in charge how Spudnuts differ from regular donuts. The purpose of this is to see if they actually do make Spudnuts or similar, or are just using the Spudnut name without actually making Spudnuts. Also, some places make regular donuts for some types and Spudnuts for others, and there may be no way to know which is which without asking. "Spudnuts are hilarious until you eat one, and it shuts you up real quick." "I'll have to say that the first time I heard of Spudnuts, I thought they were some sort of potato baseball. I had no idea what kind of confectionery treat they were until someone brought them into the office one day."